As the end of the school year approaches, summer is probably on your mind. Whether you plan on laying poolside or working at your local restaurant to save up extra cash, you’re going to need to eventually interview for an internship or job. For those of you who are trying to score a job post-graduation, you should probably keep reading. While some of us don’t mind talking about ourselves on a Q&A basis, the thought of trying to win over a stranger based on our past experiences and current skill sets may be a little intimidating. While this seems silly, it is a very common mistake for candidates to not be fully knowledgeable about the position. Research the company. Get to know everything you can about it, along with what you have actually applied for. There’s no shame in applying for a job that may only somewhat grab your interest, but you better make sure you take all the time necessary to gain some interest before your interview. Also, make sure you have a few hard copies of your resume and cover letter (if needed). If you have a portfolio or writing samples, bring those as well. 2. Dress the part, but still be you. One of the common clichés you hear about interviews is to “stand out.” While that can be difficult enough in answering questions, this should be easy with your ensemble selection. If you’re interviewing for a more straight-laced, business position, then make sure you wear a suit that fits well. Get it tailored. Wear heels (not the ones that are scuffed up from nights on the town.) If you’re interested in a more creative job, perhaps writing or the arts, then you can stray away a tad from the traditional suit. Try a ruffled blouse with a high-waisted pencil skirt, for instance. 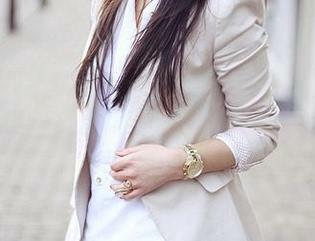 Keep your make-up and hair simple, but still done enough to look polished. Again, another interviewing cliché, but you do not need to have a slew of questions aimed at facts that you clearly read from the Internet. Make them more personal about the person who is interviewing you, perhaps what a day in their life at their position is like. Actually address concerns or details about the job at hand as well. You do not want to go into the job with the wrong idea of what will be expected of you. Showing who you actually are is key. I’ve been told on a few occasions that one of the main reasons I got a position in student organization or group is because of the way I carried myself during an interview. That is my strongest suit, so I play off of that. If you aren’t as inclined to casually speak with your interviewer, work personal stories into your answers. For example, if you’re referencing your HTML experience, start off with how you started teaching yourself from a young age making a fan site for some boy band. It’ll show you are a likeable person to be around, and will ultimately make the interviewer remember you. 5. Jot down notes and questions. And this doesn’t just mean after you shake hands and leave. Send personal written thank-you notes to anyone who interviewed you or assisted your interview immediately afterwards. Don’t just say “thank you,” but also mention something specific that you talked about. Your notes will definitely come in handy here. Of course, remember to stay calm, focused and optimistic. Do mock interviews with friends and family. Many career centers on campuses offer them as well. The more comfortable you are with speaking about your qualifications, the better it will come across during the interview process. Good luck with the job hunt!